Indigenous water protectors at the Dakota Access Pipeline construction site just got assistance from military veterans. Between December 4 and December 7, veterans of various branches of the United States armed forces have scheduled a “deployment” to show solidarity and lend support to the Standing Rock Sioux in North Dakota. The event, called “Veterans Stand for Standing Rock,” already has 2000 confirmed RSVPs on Facebook, and features several warriors who have served in the military. On Dec. 4, if everything goes according to plan, hundreds of veterans will muster at the Standing Rock Sioux Reservation in North Dakota. 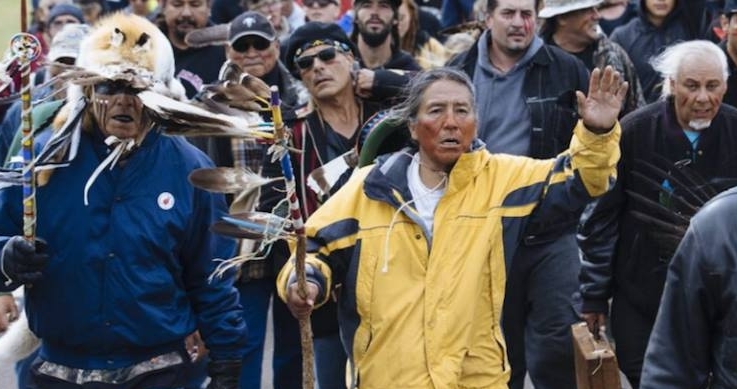 The mission: To stop the Dakota Access Pipeline. Clark Jr. is one of the most vociferous opponents of the Dakota Access Pipeline, a controversial 1,170-mile project that, if and when it is completed, will shuttle an estimated 470,000 barrels of crude oil every day from North Dakota to Illinois. “It’s immoral, and wrong, and dangerous to us all,” Clark Jr. adds. Responses to "Military Veterans Prepare to Join Standing Rock Protectors to Stop Pipeline"
Thank you AGAIN for your service to protect our land,turtle island..May Creator protect you all in fighting the good fight with your fist open in prayer..Much Love to all of you!! Thank you!! thank you thank you!! Standing Rock. God bless you all! Please hurry!! The oil police are trying to evict the Standing Rock folks before you get there! Thank you so much. You are our true heroes!